As a writer, I prefer my characters tell you their own story rather than me being a storyteller. I give you the opportunity to look at each character’s motives, imperfections, desires, and dreams. In each of my books, there is always a story hidden within the story. My background as a Psychologist allows me to develop characters who must confront issues common to us all. Reflected in my novels are the twists and turns we often take in life. However, the predictability we crave is often missing. In “The Mirror Image on Acadia” and in “Coincidence by Design” I take the liberty to have a little fun with the mystical side of existence. Enjoy and send your comments, or lets chat on Facebook W. Scott Mitchell. I like to tell a story that lives within the story. In “Coincidence by Design” the story within the story deals with the issue of free will versus fate and are they really two sides of the same coin. 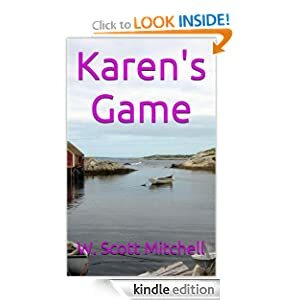 In “Karen’s Game” the reader will find my psychological background in the subplot. We all make choices about the things we “should” do as opposed to the things we actually do. This novel also takes on the human quality of saying “do as I say and not as I do.” I love to bring out the imperfections as well as the positive qualities that make us human in an effort to make my characters become people you might know. Unless I am playing with the mystical side of life, I try to avoid the sensational in an effort to make what you read seem possible. . The first thing I do is to make sure the story I offer to a reader is not a repeat of my last work. Repeating a previous work while changing the names is what I call the the best new arrangement of the same old song. I start with a subplot idea and then try to build the story as an overlay of the subplot. An example of this is a book I have just started where the subplot deals with the human need for personal affirmation through religion, fortune telling or other opportunities. This story is related through the eyes of a young man who has joined “Brother Willy’s Traveling Salvation Show.”. My Characters are usually well conceived in advance but also grow or change given the events they encounter. I go out of my way to ensure my female characters are seen as strong and independent while compassionate. Sometimes I find it easy to write in a woman’s voice but I also confess many times it is not an easy process for me. I both listen and talk to my characters. Once I have developed the character, I often think of someone I have known who reminds me of the character and try to think how the real person might act in a similar situation. Write because you love to write and for no other reason. Tell a story that has some value to it beyond just entertainment. Keep writing even if you get discouraged over your earning potential. Write what you know or think to be truth. Having grown up along with the growth of technology, E books make sense to me. They go everywhere, anytime, and you never have to leave home to get it. I suspect that as time goes on, paper publishing will become less and less relevant.